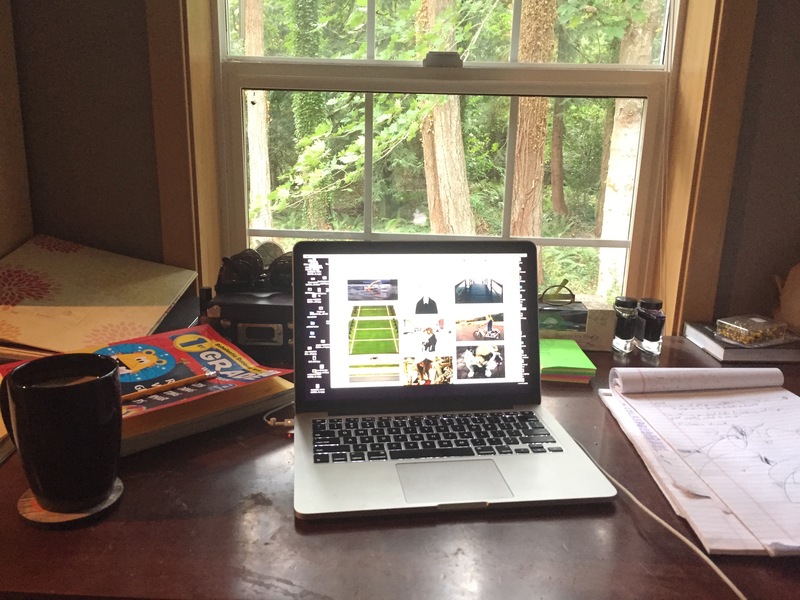 Signs You Have Back-to-School Anxieties: You Clean Your Desk. I’m so devoted to this school year, I even cleaned my desk. So, I’m just starting our homeschooling day today. 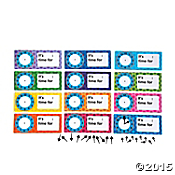 Ain’t nobody got time for that scheduling mess! 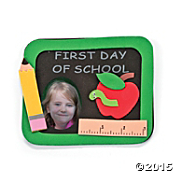 The bottom line is: I am super excited to start school. We just need a good, solid routine to get back into, and I am all over that. 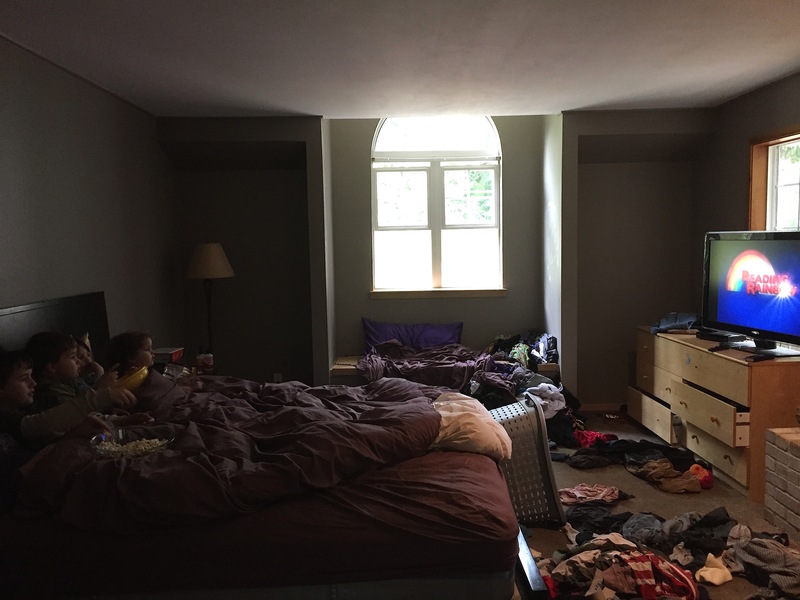 We moved in the middle of the last few months of school, so it was too late to join anything. 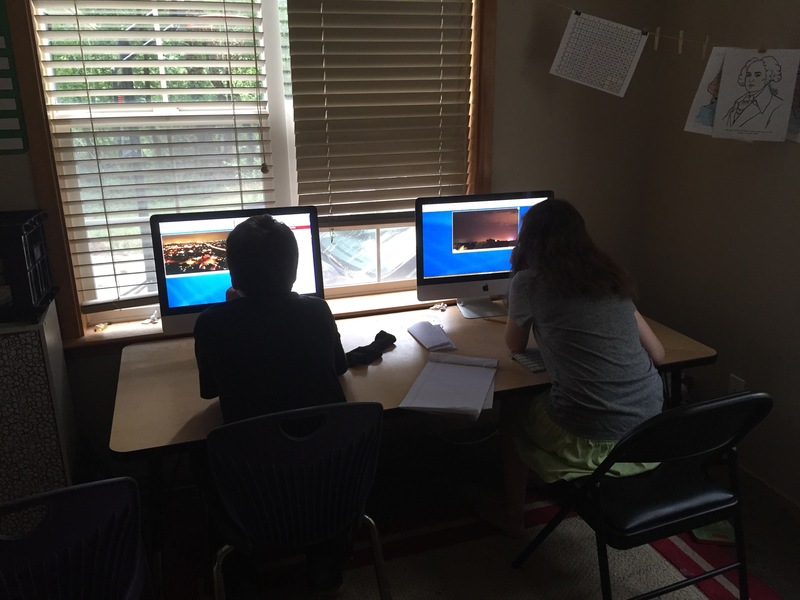 So we have just been doing school on our own and getting together with friends during the week. 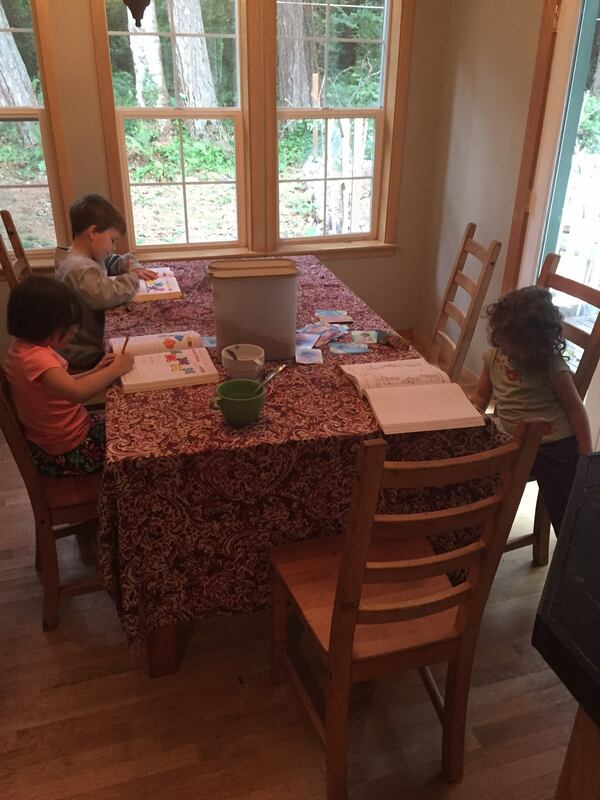 It honestly was a much needed break that gave me a good amount of time to rest and recover from moving, and I was able to rethink our homeschooling operations without being rushed…but by this point, my schooling Shabbat has ended. I am so ready for school to get going again. I have already organized our entire week, hour by hour, and printed out a color-coded spreadsheet for our weekly agenda and tacked it to the wall underneath the calendar in the kitchen. We have morning routines, school routines, evening routines…the kids will know when to get up, when to get out the door, lunch is, when class happens, when homeschool happens, when they should be taking showers, and when they should be in bed. This should get us into a good rhythm. Naturally, on my own, I’m not much of a routine person. But functionally, with this many people in the house and with a homeschooling agenda, it is necessary; if not mandatory. If I don’t have a totally solid routine to work off of, I don’t know what I’m doing or where I’m going, or if I should make another pot of coffee before noon, or whether or not I should change out of sweat pants…(probably), or if the kids are keeping up with their studies, or if any of us have remembered to take showers. And smelly feet in our car is the worst. But the truth is, when I start every year of school with the kids, I spend a good few days (see: weeks) with my stomach in knots. 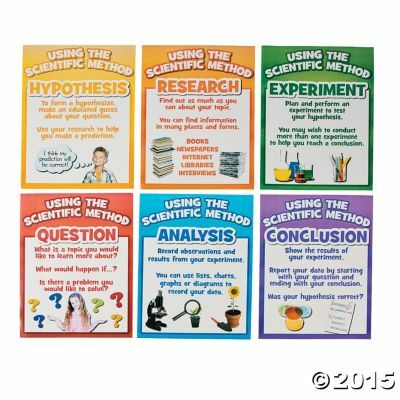 What curriculums should we use? Are the kids up to speed? Am I up to speed? Are we doing this right? Is the earth still spinning…is that on the agenda?? I take my kids’ education very seriously, and I want to make sure they are getting as many opportunities as possible to learn and excel. However, when one of my kids forgets what a fraction is in the middle of summer…my brain exits my skull and finds the nearest cliff to jump off. You forgot what a fraction is?! Are you *kidding*?? What have we been doing all year?! Gahh! I did spend most of yesterday freaking out over this. Not gonna lie. What I did, instead of throwing in the towel, was rolled up my sleeves and found my bootstraps…and got busy in our schoolroom with the kids. 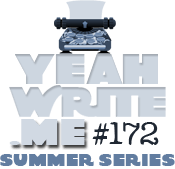 Forgetting things over the summer is pretty typical for kids, so I’m going to be spending some quality time working with them for the first few weeks. I am going to be going through each subject with them, step by step, until we get back into the rhythm of working. and our classroom mascot, for moral support. Who left all these mugs out on the counter?? …oh, yeah. That was me. I don’t remember where I saw the last article giving tips on how to keep a busy home clean. It might have been facebook, it could have been in my email from some subscription I don’t remember signing up for, in order to get froyo coupons. It doesn’t matter, though: these articles are as prolific as the germs for which they claim shouldn’t exist in your sink. And I knew I shouldn’t click the link. I knew it when I saw it…but like a dork, I did it anyway. Just off the bat, I knew it was going to be a useless article with zero helpful ideas, and just more reasons why the entire facade of a “clean home” is a big fat lie. Clicking “Habits of Mother’s With Clean Homes!” is the same bs bait and switch as the game Portal’s “Cake” red herring. For some context: in the game “Portal,” you begin the quest with a completely fictitious aspirational reward, with finding cake around the level as the motivation. 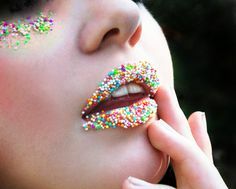 The cake is supposed to be a benefit to you, somehow, so you keep heading towards the cakes. It’s like finding the green 1-Up mushrooms in Mario, for example. The more green 1-Up mushrooms you get, the more lives you get; and the more lives you get, the longer you can play! Score! Except, the 1-Up green mushrooms end up being completely useless. They do nothing for you, and pretty soon you run out of lives…and your character is dead. You finally find out in the next level that not only is the cake not your motivating factor, but actually, “the cake is a lie” is spray painted all over the walls. 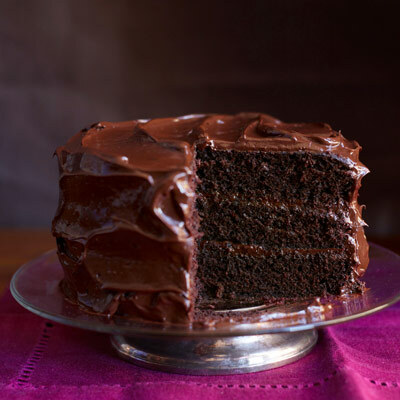 All this being said: these seemingly inspiring articles are exactly like the cake. You keep trying to get better at tidying up, though! And you click on these links that are supposed to inspire you on how to keep your home clean all the time…even though you have an army of people living in it, and the fact that I wasn’t put on this green earth to scrub grout every day… even though they are all a useless, unmotivating, fruitless lie. I have proven to myself time, and time again, that I am more than willing to relandscape my entire yard before I am willing to fold laundry. It is boring, it is time consuming, and it is never ending. With every folded shirt I think of the two clean shirts that are on the kids’ floor. For every sock I wash, I think of the dozens that are missing. Sometimes we find them, but they are in extremely unhelpful places, such as the backyard, the dishwasher or the back of the pantry. There have been a few times when I really did keep up on the laundry, and I really did fold them all right out of the dryer and put them away in their respective drawers. I did it for a whole week once, just to see if it could be done. And it could be done! By golly, I did it. But do you know what else I did that week? I didn’t have time for anything else other than maintaining laundry; even with the help of my minions. That stick and carrot didn’t last long, I’ll tell you what. I can see how this would be a really good habit to get into. Goodness knows, the amount of coffee grounds, yogurt and bread crumbs spread across my counters, alone, could probably feed a small village. I like to keep the counters cleaned, as much as humanly possible in a house with 7 people who use the kitchen constantly, and 3 loads of dishes each day. I have given up trying to keep on top of the dishes: it’s just an infinity loop, at this point. However, the stove is another matter. After I am done making dinner, and we have sat and ate said dinner, and the kids have cleared the table…I am done. I am doney done. There isn’t one more thing I want to finish or clean for the rest of the night. So washing the used pots, or the used stove, just doesn’t happen. Even though it would probably be a good idea, and it probably would make life easier…after a day of chasing after 5 kids, finishing homeschooling, making 3 meals for a bundle of people, and making an effort to ignore the pile of clean laundry on my bed…I am just too tired to clean the stove. I just don’t care at that point. Unless there is cake on the stove. And then I care a little bit more. omg. Okay, so, do you have little kids? And time to tell them to put their shoes away every 5 minutes? Because, it’s not happening. We have a shoe rack, and the kids are supposed to put their shoes on the dedicated shoe rack before they enter the house. However, sometimes they put their shoes back on when they go to play outside for 5 minutes. And if I am in the shower, or getting coffee, or daydreaming about maid services for a few minutes…those shoes are going somewhere else, other than back on the shoe rack. And we have a few jackets hanging on a tree in the backyard; so I discovered yesterday afternoon, when I was outside looking for shoes so we could go to the Library and return the books… we also found. 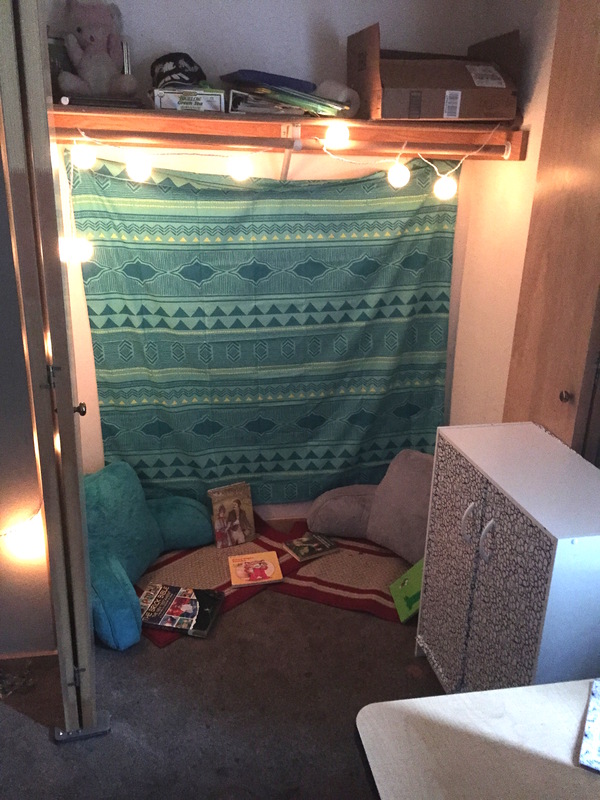 Listen, the truth is I love forts more than my kids do. Soo, we just have more blankets than is “practical.” Simple as that. I’m not really sure what they are getting at here…. like, I don’t need extra Happy Meal toys? Because I have plenty of extra Happy Meal toys. Or Legos? Trust me, you can never have too many Legos. Shoes? Lipsticks? Sunglasses? Wineglasses…? Listen, I’m just gonna stop it here and say that this list isn’t my piece of cake. Back to the home essentials. There we go. That’s my happy place. My husband and I met in the same grade in high school, and we got married 3 years after we graduated. 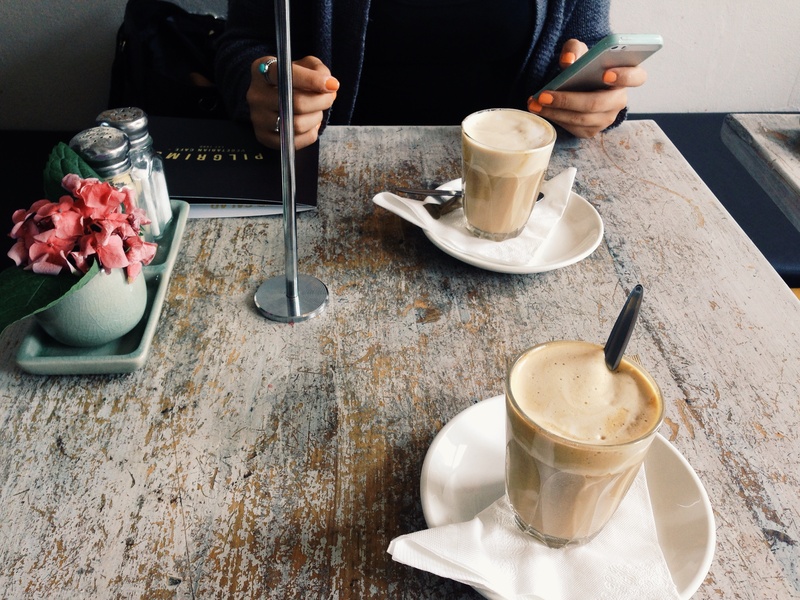 He tells people that he was ready sooner than that, but I “made him wait.” Which is kind of true…we both come from dysfunctional, broken homes and we met in high school. That is just fraught with statistics saying the relationship wasn’t going to last; so, I wanted to get married after I turned 20. I didn’t want to get married as a teenager. That was my condition, and, so, 6 days after my 20th birthday he proposed to me and we were married a couple months later. We have been together for 21 years, as of this May, and we have been married for 16 years, as of this July. I had warned him that something was wrong with me before we got married, and I told him he needed to be prepared for it. However, I wasn’t prepared for the unconditional support he gave me in finding a diagnosis, and ways to control the epilepsy. It has been with his support and his holding my hand the whole way through that has gotten me through the worst times, and by now I haven’t had a seizure in about 5 years. In our marriage we have never gone to bed at the same time. He stays up to study and work late in the garage, and I tend to wake up much earlier than he does. In our marriage we have put each other through college and stayed up together to watch “Blacklist” after we put the kids down for bed. We haven’t had spontaneous midnight trips to…I”m not really sure what’s open past 9, so it would be a spontaneous midnight trip to realize everything is closed at midnight? He doesn’t braid my hair while I am watching a movie, and I don’t fetch him beers while he watches F1 racing. We don’t have pillow fights in our pajamas, and we don’t paint our fingernails while talking about friends. We do go exploring with our kids a lot, and we do spend hours on the front porch drinking whiskey and talking about theology. We do ask the other person what they think about what we are wearing…and what we aren’t wearing. I love cooking dinner for the family, and he loves taking the kids hiking in the forest. We enjoy laughing together and debating together, and living together. Marriage isn’t a sleepover, I’m sorry to break it to you. 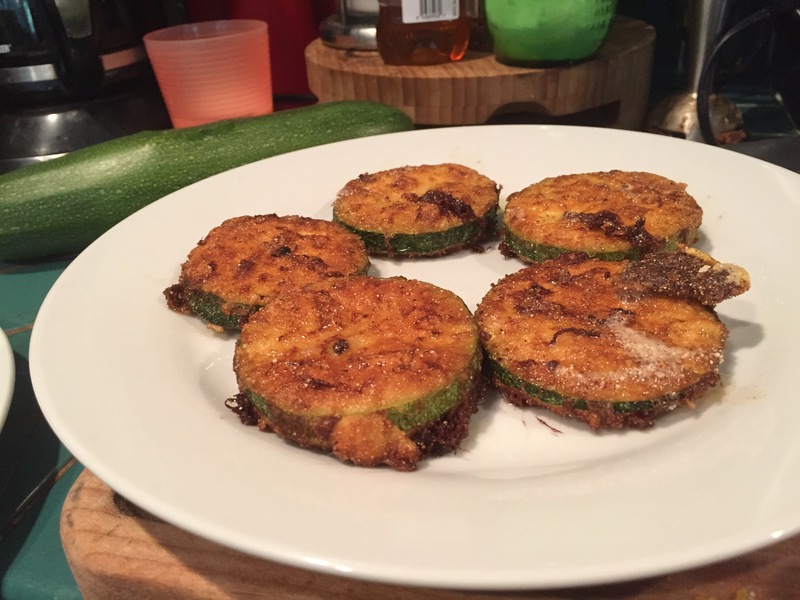 I posted a question on Facebook: how do you fry your zucchini? 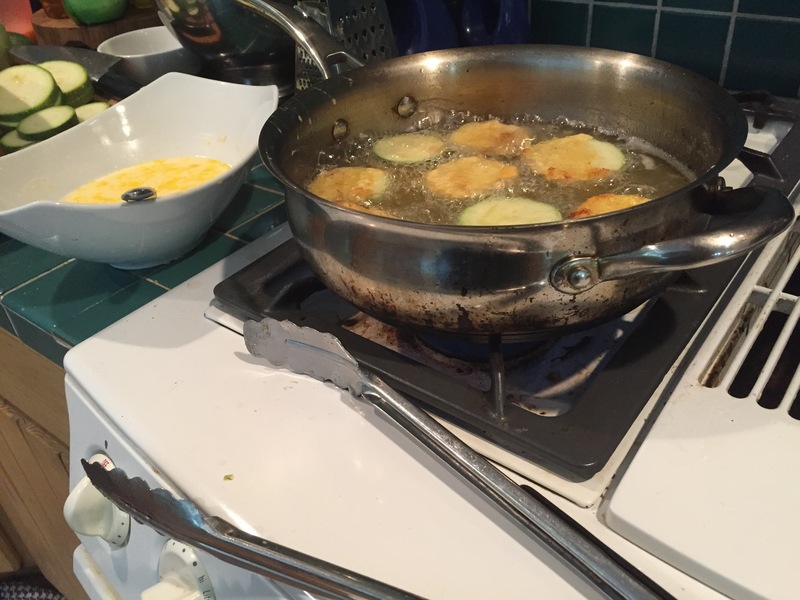 It is still zucchini season, and so I am still finding ways to fry, and cook, zucchini. 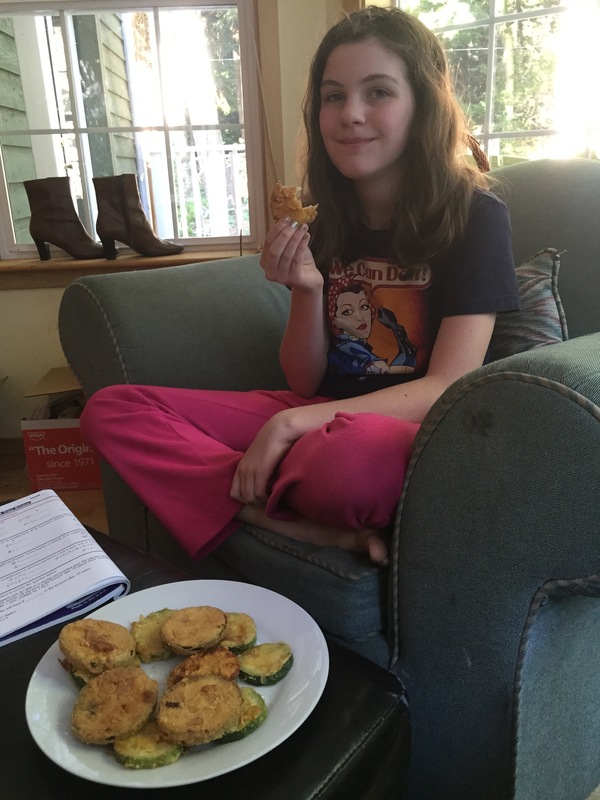 And let me tell ya: fried zucchini is one of my favorite foods on the face of the earth. 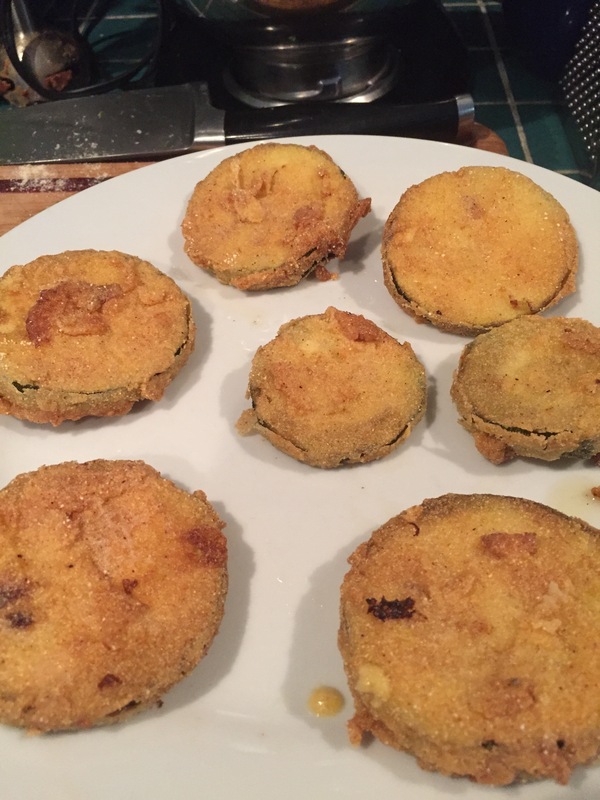 Good fried zucchini. 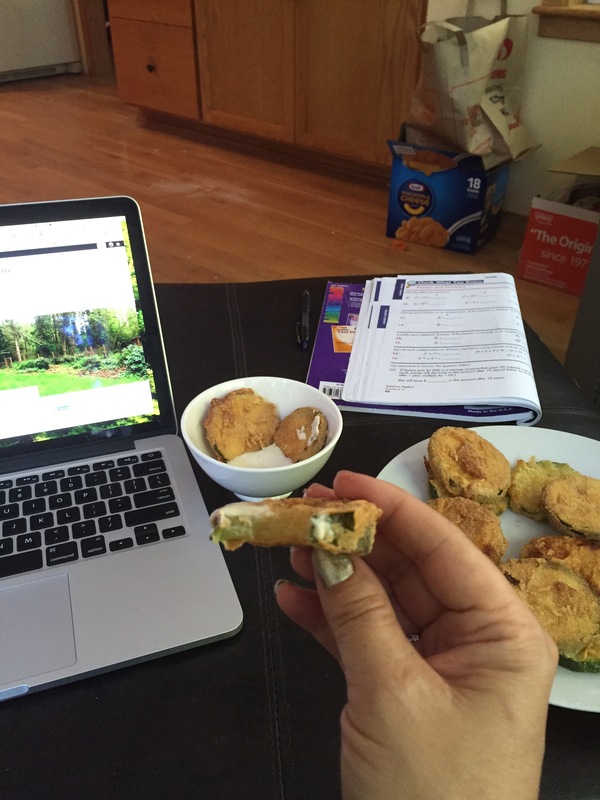 Gluten free fried zucchini…that actually tastes good. 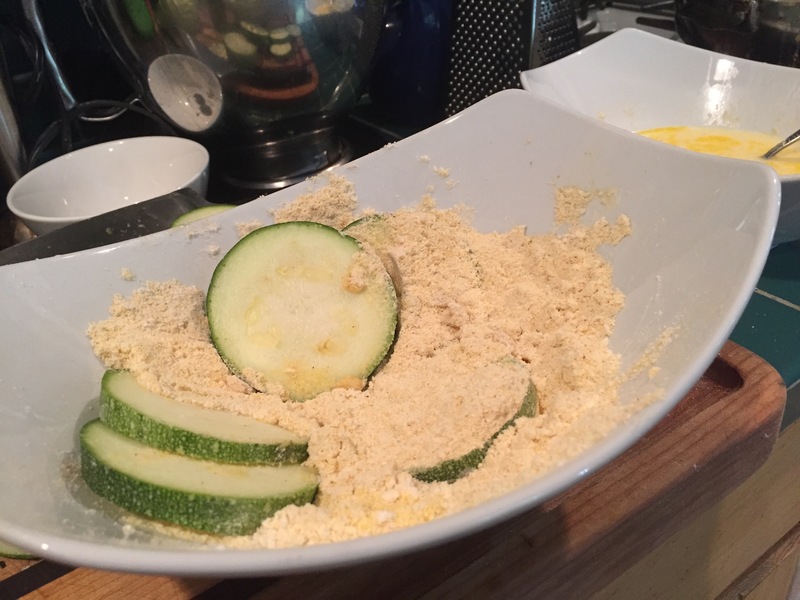 The way I have always done it, and the way many recipes I have read, is to slice the zucchini, dip in an egg bath, coat in gluten free flour/gluten free corn masa and then place into boiling oil until cooked. Egg Bath. Then Flour. Then Oil. But then, I started noticing…some recipes had the Flour, THEN the Egg Bath, then Oil. This concept is blowin’ mah mind. 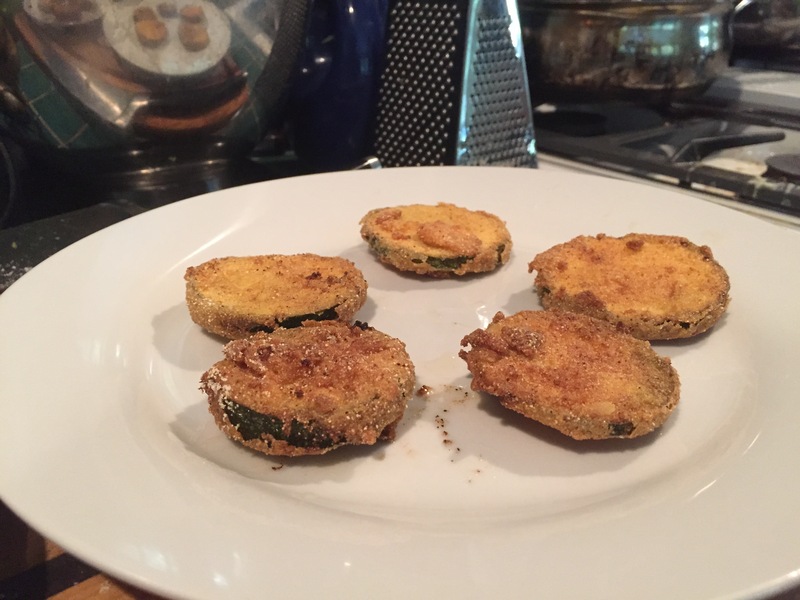 Could I have been frying zucchini wrong my whole life?? I have to know….which way is it?? 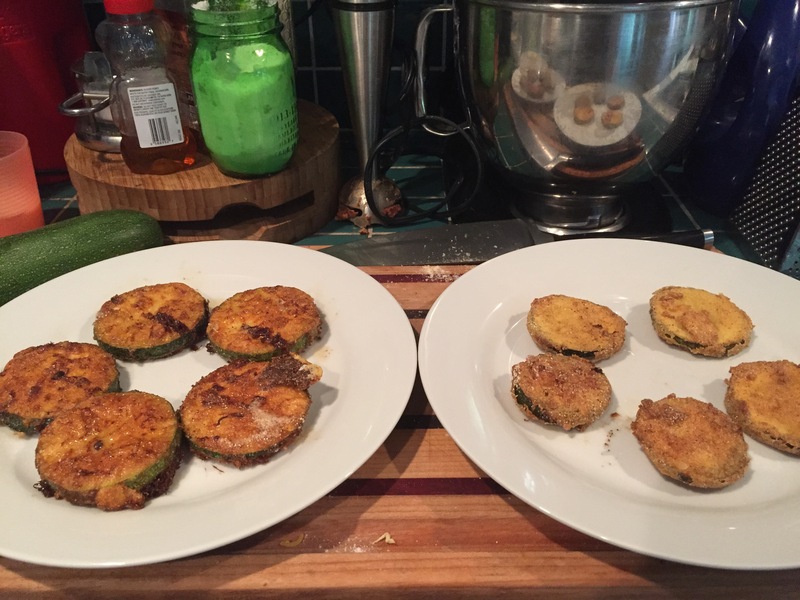 And…I am just saying, that I am only making plates and plates of fried zucchini for you. So, I have to know: what came first? The flour, or the egg bath? First, the flour, egg bath, oil. The flour didn’t stick to the zucchini very well, and some of the batter actually peeled off when I flipped them. They did come out pretty crispy and golden, but the batter didn’t stick to the skins at all. I also noticed that they were very watery afterward. 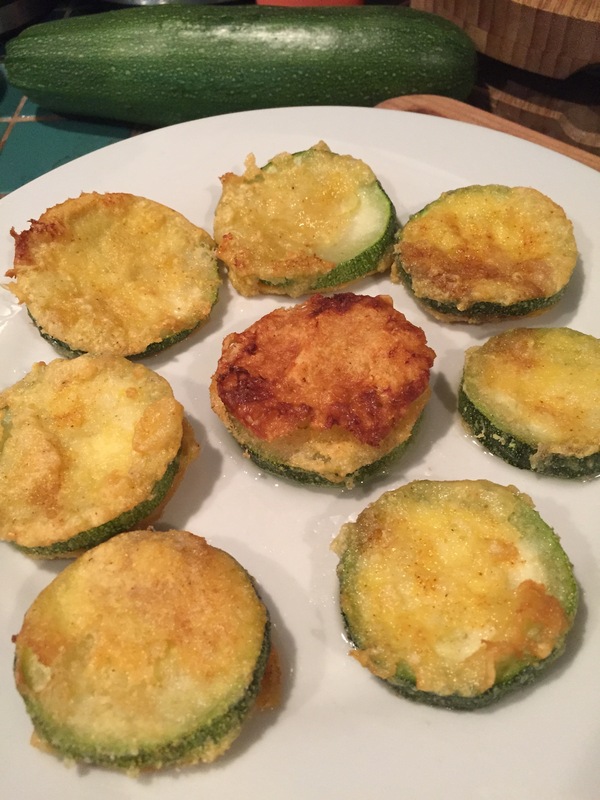 I noticed more water under the zucchini on these, and when I ate these they were very juicy. Now, the Egg Bath, Flour, Oil. These are on the right, and you can see the difference between the two pretty clearly. These turned out significantly better, I think. 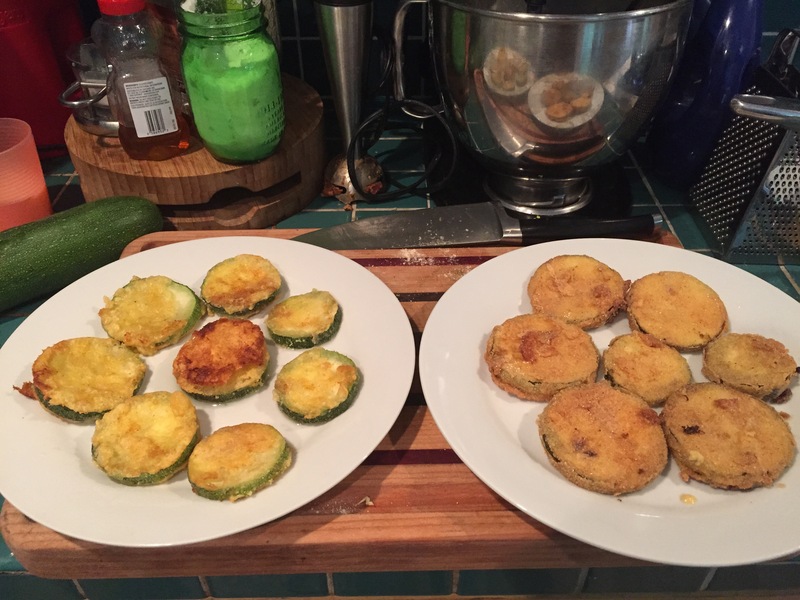 The batter was evenly coated around the entire zucchini, and it was a thicker batter. There was also zero juice on the plate, and very little/no juice running down my hands when I ate them. I liked these significantly better. Now, round 2! …just to be sure. The Flour, Egg Bath, Oil combination did better this time but still a bit lacking on the sides. 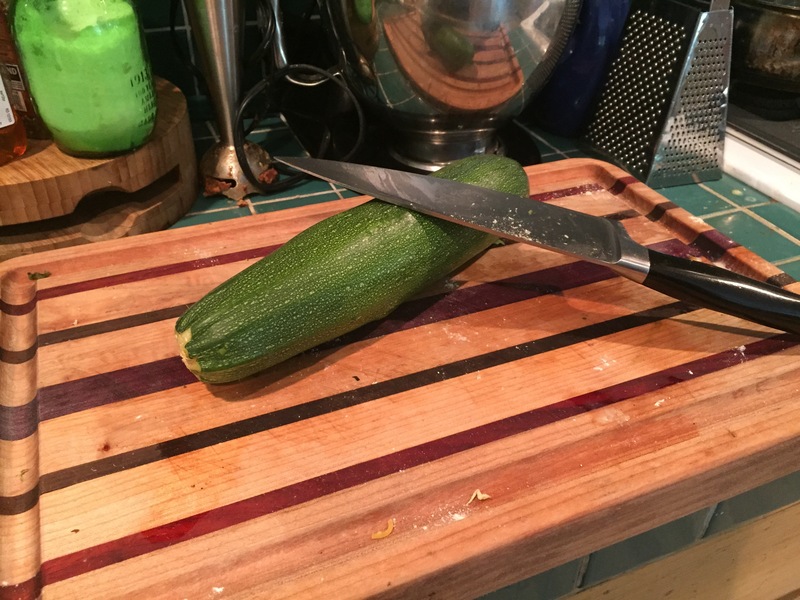 The batter doesn’t seem to stick to the zucchini very well with this method. The Egg Bath, Flour, Oil combination did just as well the second time. Still evenly coated over the whole zucchini, and a consistent golden brown. In the end, I would choose the Egg Bath, Flour, Oil method. But…they still all tasted amazing. Ugh. The chutzpah on this guy, I swear. I can’t get any of this out of my head. It’s like brain-tar…it just sticks onto your brain and rots it into a toxic goo just thinking about it. Money is clearly not an object to Donald Trump; but that isn’t big news. He has been loaded ever since, forever. And he isn’t royalty, like Prince Albert II from Monaco, who is estimated to be worth 1 billion, himself. Even the Queen of England has a personal net worth of $500 million (not counting her government stipend of $12million per year, nor the property she owns, which comes out to something like 20 billion; and probably a few other things, like countries/planets). But just the notion that Trump would pay 1 billion dollars, like it was a drop in the bucket, to buy…I mean win…the presidency is just disturbing. At a time when the middle class is being threatened, food prices are skyrocketing, unemployment is a serious problem for people, education budgets are out of whack, Social Security is being threatened and the national debt, alone, is somewhere around 19trillion dollars…. There are so many things families forgo in order to make a home for their kids, and Trump is basically taking a $1billion vacation by running for President. A trip to the Bahamas? Nah. Too much sun. A Mediterranean cruise? Nah, there is no yacht big enough for his ego. But a helicopter trip around the USA, running for President? Oh, sure. Why not? YOLO, amiright? But this entire brain-tar thought train has me thinking. 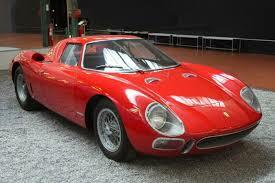 What else could a billion dollars buy you? Teachers- According to Forbes, the “average” salary of a teacher is $56,740. So, for 1 billion dollars you could pay for the salaries of 17,724 teachers. Maybe in North Carolina, perhaps? As we can clearly see here, there is nothing on the budgets for teachers! Next question? 1 billion could, actually buy you the White House! There are a few things I sincerely love more than chocolate. Shoe sales, dress sales, free gluten free pizzas (I’m a cheap date, what can I say), and back to school shopping. 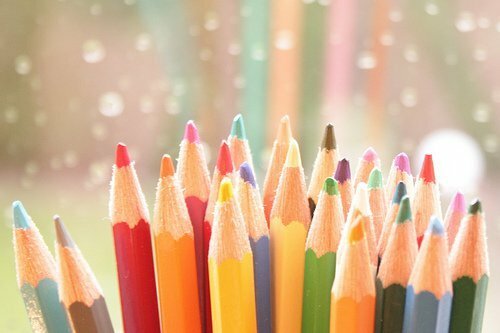 There is a primal thrill of grabbing a fresh pack of yellow pencils and throwing them in the shopping cart, right next to the stack of new spiral notebooks just waiting to be filled with doodles, hearts and tropical landscapes dripping with mermaids. …and schoolwork. Around the doodles. Fresh binders, new packs of binder paper, pink erasers…I love them all! And I am buying…them all! I am awfully jealous of teachers. I have been homeschooling my kids for 8 years now. 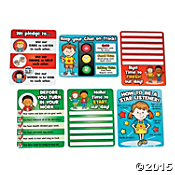 We have kept up with the 3 S’s: standards, socialization and schedules. I was a teacher before my husband and I started having kids, and I have my degree and have passed the state certificates/tests necessary to be a public school teacher, and I also enjoyed some private school substitute teaching, as well. I loved being in the classroom with the kids and teaching them about the Constitution, or doing math games on the blackboard. I remember this one time when I was substituting for a few days in a Kindergarten class, there was a little girl who was always goofing around during math, and I could tell she was just stalling on her work because she didn’t understand it. So I took her to the front desk during naptime and we quietly worked out how to add apples from apple trees together on the whiteboard. All of a sudden, there was a clarity in her eyes as she finally realized what addition was. 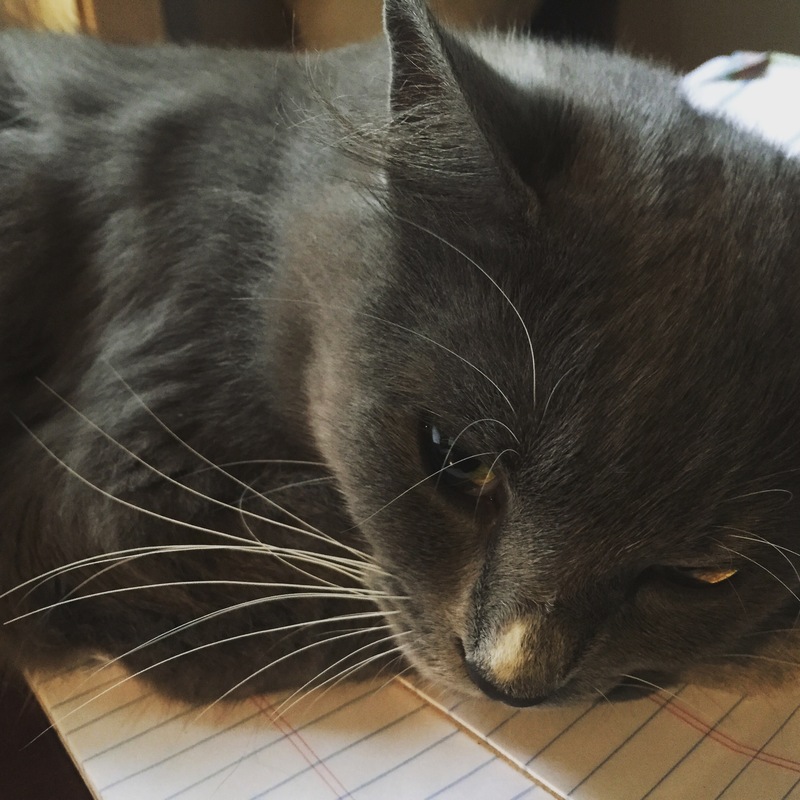 Suddenly, she was finishing her entire math worksheet…and I helped her get there! That happened well over a decade ago, but that moment when I helped her understand the concept of addition is a magical moment I will never forget. 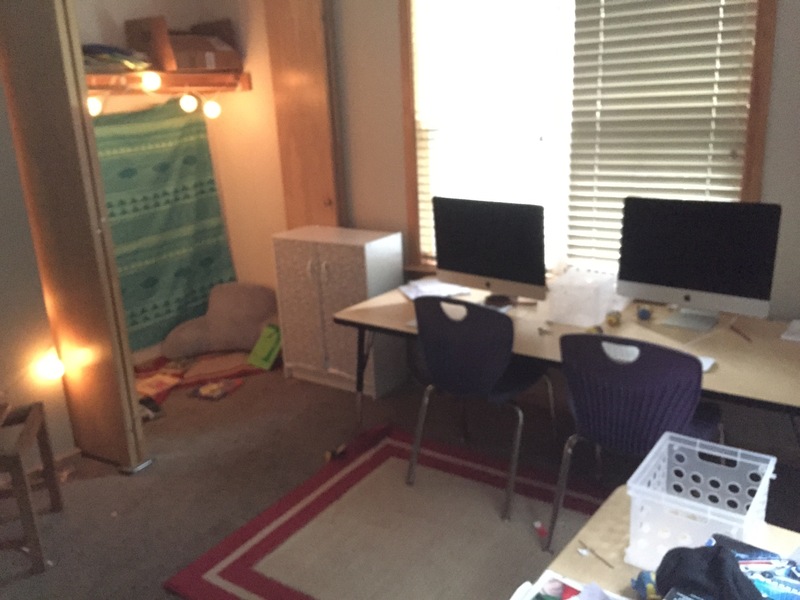 When we decided to homeschool, I was excited…and terrified. It seemed like there was a safety net in a school classroom that mystically exuded knowledge; but at home? Would school just be on the chore chart, or could we actually make this work? Could I still hold the authority of a teacher when I was still wearing pajama bottoms at 4 in the afternoon? Would the kids learn how to read under my guidance? Not only have they, but I now have 8 years worth of magical breakthrough moments under my teaching belt; which is awesome. There are the very little details which the schoolroom has, which doesn’t come with homeschooling. My kids don’t come home with hand turkeys at Thanksgiving, they don’t bring home paper plate snowmen in January, and they don’t bring handmade cards for Mother’s Day. There have been times when I had no idea it was Columbus Day, or that some schools take 3 weeks off during winter break. 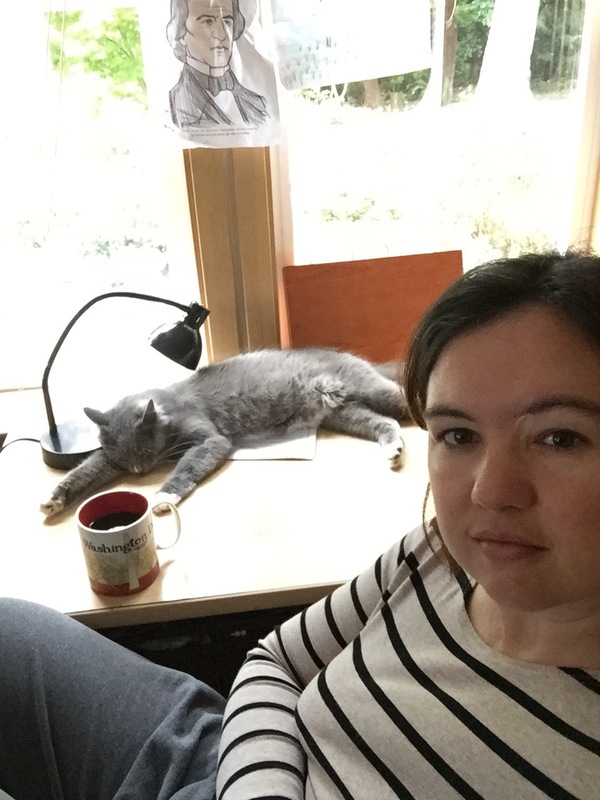 I take homeschooling very seriously, and sometimes I have to remind myself that all the knowledge and information my kids have learned is not going to fall out of their heads if we take a day off…or a week off! They need a break, and I need a break. Otherwise, we are all going to burnout; and that won’t help anyone develop the love of learning, which is the entire point of this adventure. 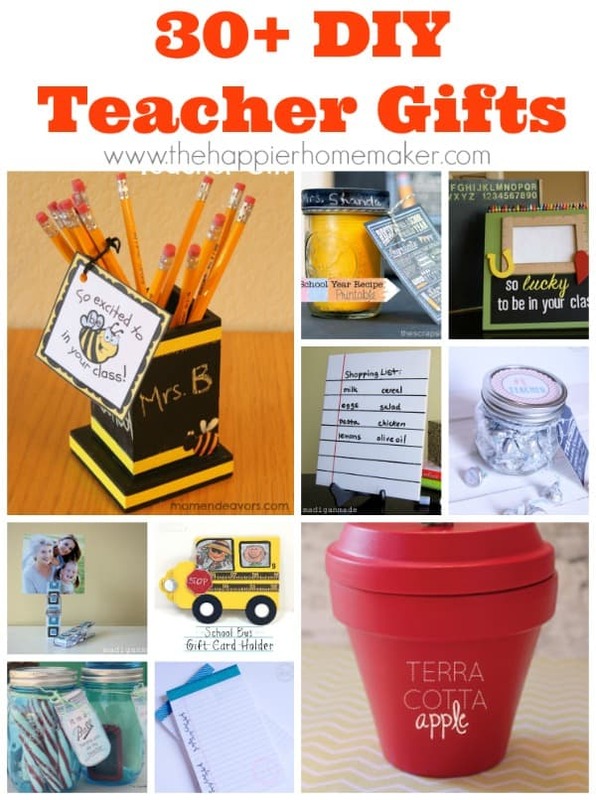 Yet, around this time of year, seeing facebook and sundry websites littered with the teacher appreciation gifts, I do get a little forlorn about missing that aspect of school. Am I going to mope around, and drive very slowly past elementary schools? No. That’s creepy. Come on. go to Oriental Trading and buying myself some bootstraps, baby! 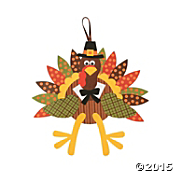 And, of course, turkey crafts for later. I remember when I was in the 4th grade I was in Mrs. Dawson’s class. She was a pleasant teacher with a warm smile who was very interested in educating her students. She had a blonde helmet of hair that was as immovable as her tenacity for teaching. She also gave me my first C in Math. But, that’s beside the point. Mrs. Dawson had a spot in the mornings when a few other classes crammed into our room before we started Language Arts, and we all watched an hour of Reading Rainbow. I loved Reading Rainbow. LeVar Burton was pleasant and charming, without being puerile or condescending. He showed us how the flint of a book could spark the imagination, and take you all across the world on the flame of the story. Reading had always been my favorite pastime, and I remember at the time going through the length of Nancy Drew books we checked out of the library. So, listening to LeVar Burton tell us how exciting books were was right up my alley, and I was able to see other kids who loved reading almost as much as I did! 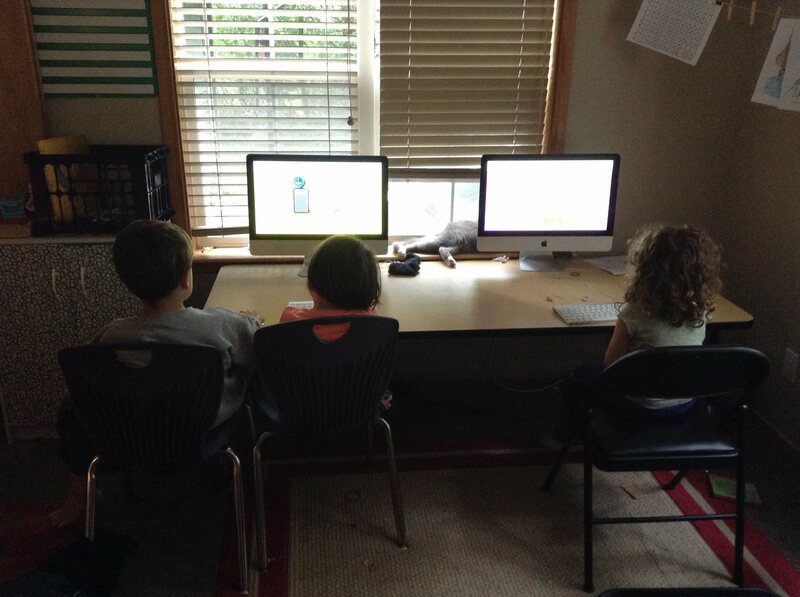 They had to be the luckiest kids on earth, just reading books and doing book reviews all day. 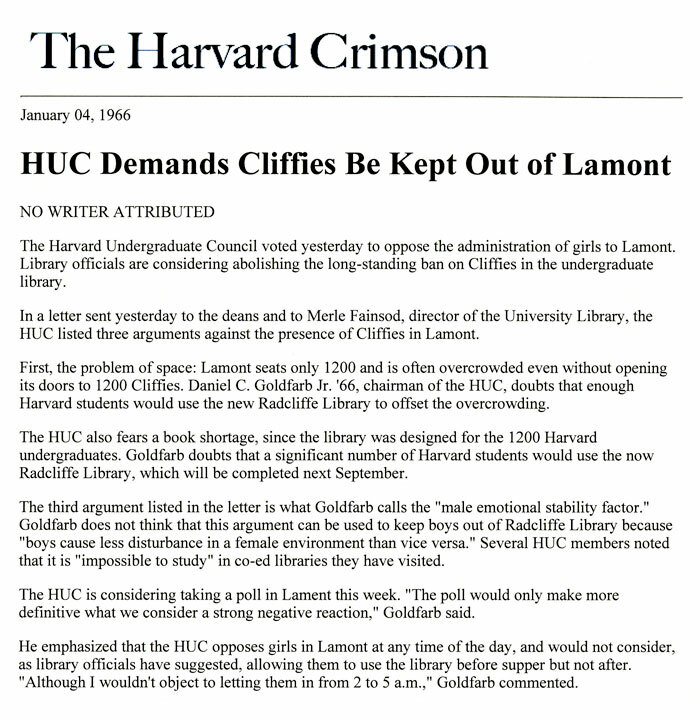 This was definitely my first aspirational dream: to read for a living. So, how excited was I to find out that Reading Rainbow was now available on Netflix?? Laundry Day… kind of half-happened. What I would like to teach my kids is how reading is crucial to life. Through reading, we learn about what has happened in the world, what some people think will happen in the future, what is happening now, and more importantly how people feel about it all. We are able to hear the voices from across the world tell us what the wind smells like in Nepal, or how the bread tastes in St. Petersburg, or what the caribou sound like in Manitoba. I would like my kids to see books as the perspectives that continue to carve out the story of mankind, and the instrument that represents the soul of the world. 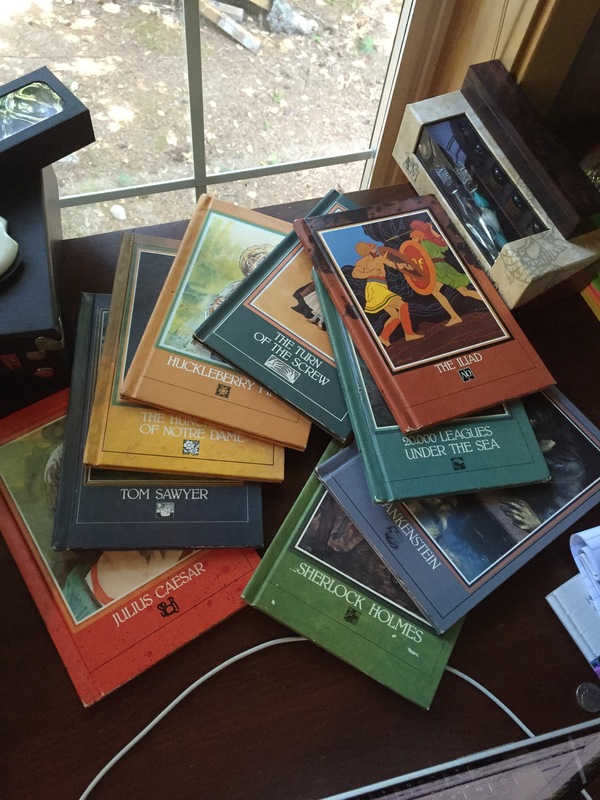 I still have a set of books I got from a month-by-month book club when I was a kid. These were only about 20 pages long, and heavily illustrated; but they were the deeply abridged stories of Classics. However, when I read these books, I found I was drug into the stories so deeply that I forgot that time existed. The noises around me were silenced. All the problems I had in school disappeared, because no longer was I an average kid in LosAngeles…now, I was was on the submarine in Jules Verne’s books, or sailing down the Mississippi with Huck, or being scared of ghosts in James’ gothic stories. The doors of possibility kept opening with each turned page, and my ideas of what the world was developed into what the world could be. Reading opened doors of imagination for me in ways other media can barely fathom. Reading has been a gift of creativity that has sparked the incurable flame of curiosity in me. There is nothing more I would love than to put the gift of flint into my children’s hands so they can spark their own curiosities. We already have a weekly library routine, and the kids have read through a few short volumes of books available on their shelves. Already, I have seen their tastes in literature change and grow as they read more and explore further down their reading rabbit hole. 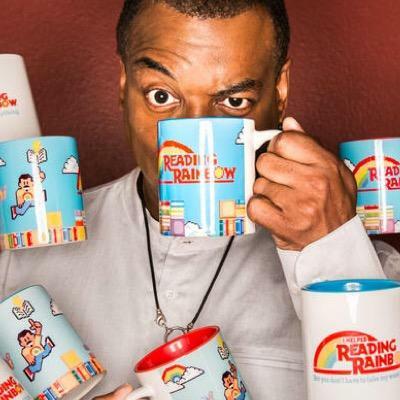 So, how much fun would it be to incorporate the spark of Reading Rainbow into the reading routine, where they get to see other kids, who are reading different books, and who get excited about reading along with them?? 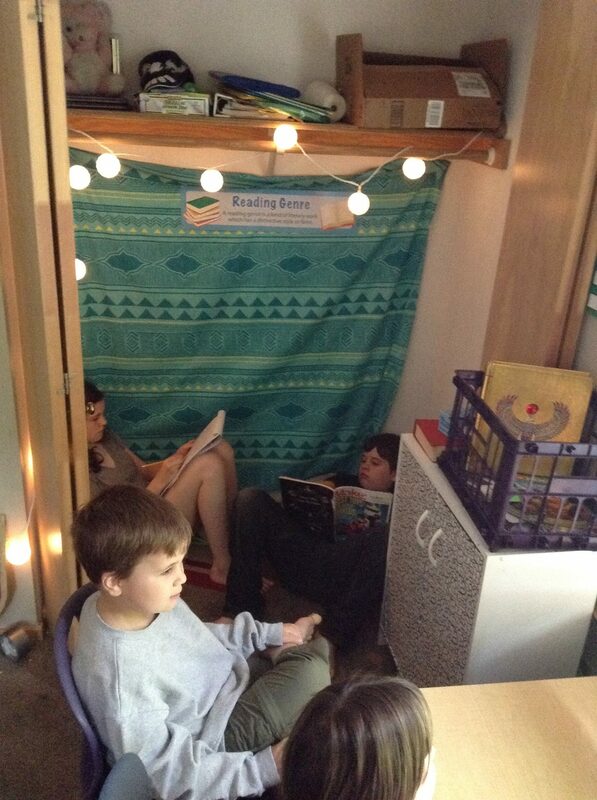 The only thing that makes reading better is sharing your ideas and experiences with friends! What Mommy Brain Looks Like. For Realsies. Last night, I had a beautiful dream. I was in a cafe in SanFrancisco that was furnished in all Victorian decor. The wallpaper was faded roses with wide lace pillars that went all the way up to the vaulted ceiling. The ceilings were creamy Victorian ornate designs garnished with draping crystal chandeliers, and I remember just laying on the couch and staring at how beautiful it was. There were varnished oak endtables everywhere with reading lamps gently glowing next to the low bookcases filled with old books, and leaning against the overstuffed and comfortably worn couches, on which I lounged in ecstasy. The waiter kept bringing me glass mugs filled with frothy lattes, and plates upon plates of wonderful layered cakes. 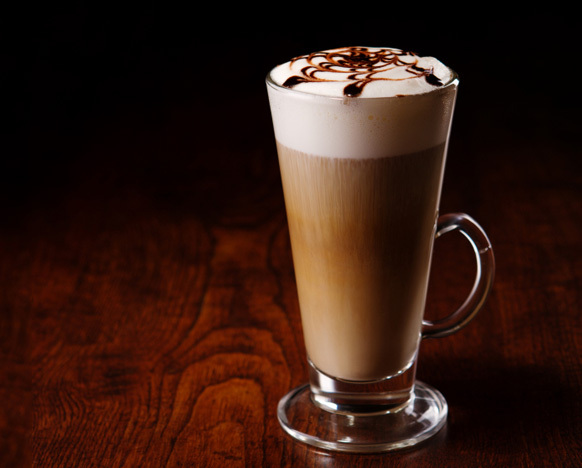 Just endless cakes and lattes, all night. It was like this, except neverending. There was a bluegrass band in the corner who were practicing quietly, and I was in heaven. I realized it was 6:31 in the morning, and I still had the kids with me, and Ben had gone to work hours ago….like…as in yesterday… to fix an emergency, and I had been lounging in this beautiful SanFrancisco cafe all night and the kids were still awake, and I had to get home before Ben got home, and it is going to take an hour to get home, and there is already morning traffic, and we can’t find the car in the garage, and we keep trying to go down more stairs in the garage trying to find the car, and the kids are miserable because I have had them out all night…and what was I thinking, staying out until 6:31am. Worst.Mother.Ever. That’s what Mommy Brain looks like. You can’t even keep a dream with endless cakes and lattes without remorse kicking in. I might retaliate with cake and lattes tonight, just to show it who’s boss. Revenge is served… with steamed milk.